As you can imagine, vet days are fun days around here. Not only do all our goats need health testing which includes Brucellosis and Tuberculosis testing that can only be done via the vet, but all of our cats and dogs need their regular rabies vaccinations – both of those are important and can never be ignored, so we are pretty regular at the vet’s office. The goats are generally the easier side of vet visits, believe it or not. We often stuff smaller goats straight into one of the cars and larger goats can now go in the back of the truck. Usually when we arrive at the vet’s office with goats, we stay outside. I remember when my husband and I brought my new doe Rainbow in, however, they stuck me in a waiting room, goat and all. Sure, Rainbow as a Nigerian Dwarf isn’t much bigger than most dogs – but the bowel control doesn’t quite compare now does it? I spent the short wait for the doctor asking Rainbow politely to not poop all over the place. By some miracle, she complied, and though she screamed when her tail was pricked for the TB test (scaring the entire waiting room), she was otherwise well behaved. That was the last time Rainbow did as I asked however – she’s been a rather stubborn opinionated addition since! On another visit with some Nigerian Dwarves, I had to turn away as the vet pricked one of my new (and expensive) does over and over, unable to find the vein to draw blood. 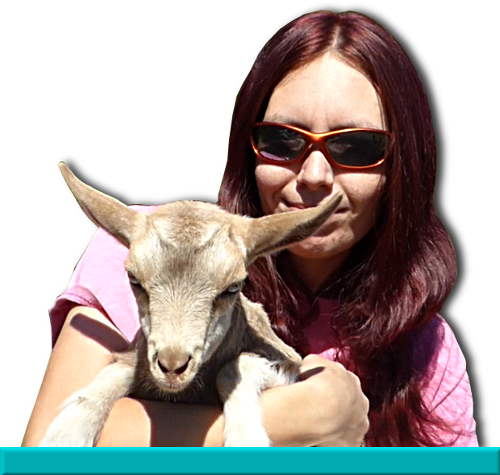 It can sometimes be a challenge, and the vets don’t often see goats as small as mine, so hard to blame them, but it was giving me terrible anxiety! Lance noticed my pained expression and asked the reason. Francine quickly explained, and before we could stop him, he stopped the vet and told them I could do the blood draw instead! Which I did – sorry vets, I’ve just had more practice, that’s all! Nothing can compare to Rabies Day however. On the farm there are four Border Collies, four Livestock Guardian Dogs, three of my small dogs, and multiple cats. Getting them all to the vet in one trip is an accomplishment, and not one we always succeed at! During one trip, we managed to get everyone loaded up only to have one of the cats cleverly escape at the last minute. She went to the vet another day. The first time the Z-Team went to the vet as pups, they were so horrified that they just lay flat on the floor and refused to move. We had to slide them along the tile to the room, the vets laughing the entire time. During the ride home afterward, Zeni the Anatolian lay her head on my shoulder and drooled in a steady nervous stream. Of course, that scenario only repeated itself in the same visit when the four Border Collies were unloaded and Ana wanted to stand next to her boyfriend, Kalev. Undoubtedly, the most exciting visit was a Rabies Day. We had somehow managed to arrive with all of the animals in tow and safely contained. The Border Collies rode inside the truck with Lance, all sitting politely on the seats and looking out the window. As we worked through all the other dogs and the cats, they waited patiently in the truck, which was left running and the air conditioner on, of course. Reloading the other animals, we asked Lance to start bringing in the collies. He went outside, only to return quickly. The collies had moved to the front seats – and locked the truck. Oh dear. We went outside and Kalev and Dov peered happily through the windows at us. Old Malka was sleeping on the backseat, completely uninterested, while the one-eyed rather anxious Ace barked at Lance questioningly. Pulling on the door handles did nothing – we were locked out! I wish I could say that one of us cleverly jimmied the lock, saving the collies from their unintended imprisonment, but that would by lying. No, Francine called Triple A, and she and I then left poor Lance at the vet’s office to wait for them. Probably not the nicest thing we’ve done! However, the Z-Team needed to be home with the goats, the cats were crying in horrible soul tearing rythem, Ana was irritated and snapping at the guardians, and my small dogs were disgusted by being outside this long. Plus Francine and I have work to do! So we abandoned Lance and the collies, wishing them well. Triple A saved the day instead, and once the collies had their vaccinations, they joined us at home, no worse for wear.